Photo by Michael Herschensohn: History in Perspective columnist Michael Herschensohn sees no sign of ‘cultural heritage’ looking up between Crockett and Howe on Queen Anne Avenue. 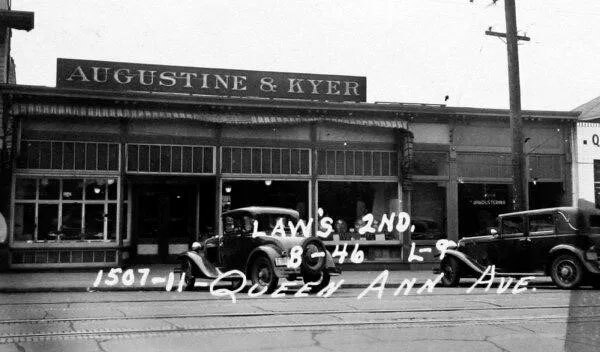 Photo courtesy of Puget Sound Regional Archives: The Augustine & Kyer store at 1507 Queen Anne Avenue embodied the neighborhood’s ‘cultural heritage’ in this image from 1937, says Michael Herschensohn. This started out as a conversation about Queen Anne’s commercial districts and how they are peppered with historic one- and two-story buildings hosting locally owned businesses representative of our neighborhood’s cultural heritage. Probing more deeply, the conversation morphed, as the idea of ‘cultural heritage” loomed problematic. Jan Hadley and Alicia Arter, in a series of articles for the Queen Anne Historical Society in 2015, noted that, at some point in the first half of the 20th century, more than 50 mom-and-pop groceries, meat markets, milk and butter shops lined Queen Anne Avenue and knit the neighborhood together. Hadley lamented the loss of those buildings writing, “Eventually, most of the small neighborhood grocery stores disappeared. Big supermarket chains — the Safeways and Metropolitan Markets — prevailed. As a result, something of value was lost. The small family run stores brought neighbors together and built community and friendships. Each was unique, intimate in size, and scale, and staffed by friendly, caring individuals.” Hadley and Arter didn’t seek to define our cultural heritage, but they may have inadvertently found it hidden in the tradition of small businesses within walking distance of one another, serving the shopping and eating needs of the community. Following Hadley and Arter’s lead, I began looking for Queen Anne’s cultural heritage today. I considered the commercial zones from Denny to McGraw on Queen Anne Avenue, along Galer Street from Queen Anne to Fourth Avenue West, along Boston east and west of Queen Anne, and even on Nickerson from Fourth Avenue North to Third Avenue West. To my surprise, both old and new buildings of different sizes host a great variety of small shops and restaurants, and those small businesses mark the life of this community. 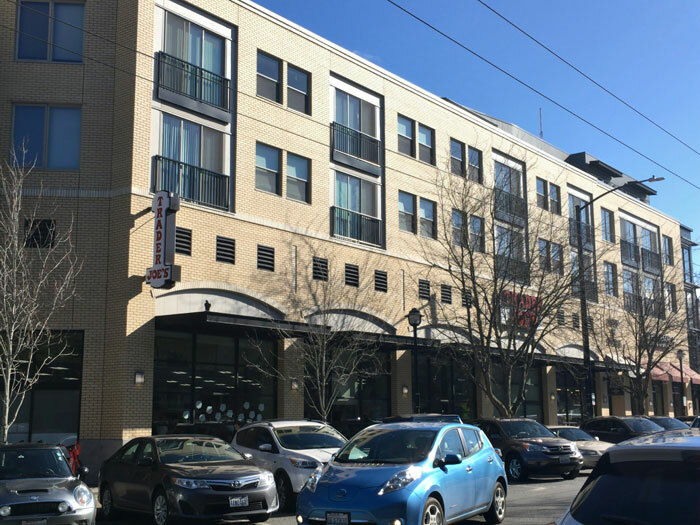 On upper Queen Anne Avenue alone, I count more than 94 individual businesses, and what seems to make our neighborhood special is that all but a few of them are locally owned. These businesses may not be standalone shops with no other branches, but nearly all of them are owned by people living in Seattle and King County who value the look and feel of Queen Anne. Examples abound: Wag-N-Wash, Eden Hill, Uptown Coffee, Café Ladro, Grappa, How to Eat a Wolf, Paragon, HomeStreet Bank, Mailstop, El Diablo, Queen Anne Book Company, Homegrown, Laundry Room, Storytown Coffee, Marqueen Hotel, Marqueen Garage, Metropolitan Market and Pagliacci. I noted in my mental survey just about as many small locally owned businesses in new buildings as in old and in multi-story as well as in one- and two- story ones. Indeed, the type of building may not be shaping our cultural heritage. Astoundingly, land use codes allowing taller, high-density buildings may have protected the traditional walkable quality of urban villages and recreated the environment of small stores that brought neighbors together prior to World War II. It could be that the neighborhood has rediscovered its cultural heritage and tradition of small, friendly shops. Seattle’s landmark ordinance 106348, written and adopted in 1977, already embraces the idea of cultural heritage, calling out any improvement, site, or object “associated in a significant way with a significant aspect of the cultural, political, or economic heritage of the community, City, state or nation.” In other words, architectural distinction is not required for landmark status, but in the 40-odd years since passage of the ordinance, and out of 450 landmarks, only four places have been designated that meet that standard alone. A few years ago, the Preservation Green Lab, a Seattle-based arm of the National Trust for Historic Preservation, did a study, “Older, Smaller, Better: Measuring How the Character of Buildings and Blocks Influences Urban Vitality.” This report tracked every census block of Seattle (and a few other cities) and concluded that the buildings that met their “smaller and older” standard contributed significantly to urban economic vitality while maintaining cultural heritage. It made the case for these smaller, older buildings as the places for startup and locally owned businesses. I loved this report, but while lacking the Green Lab’s statistical rigor, my review of what has happened in Queen Anne suggests otherwise. Today, our neighborhood’s cultural heritage resonates in the locally owned businesses that occupy both old and new spaces. Much as I want to find that heritage particularly present in the one-story brick veneer buildings or the converted houses along upper and lower Queen Anne Avenue, it seems simplistic. Protecting the cultural heritage of our commercial zones probably doesn’t mean defending only old one-story buildings. Heretical as it may turn out, the best way to protect neighborhood quality is to replace them with well-designed buildings that retain small shops along pedestrian and bike-safe streets. Even more surprising, the preservation of cultural heritage may turn out to be more market driven than we expected. “Look up” is one of the mantras of architectural history, but if you want to understand Queen Anne’s cultural heritage, you’ll do well to look down. The pulse of the neighborhood, both new and old, is best felt by looking straight ahead.